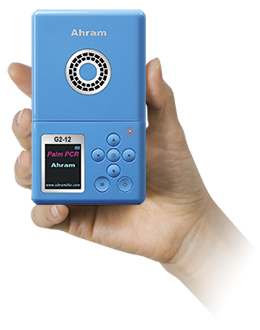 Palm PCR is a battery-powered, palm-size portable PCR machine. This unprecedented device features a fully portable, stand-alone thermocycler that delivers PCR amplification with high speed and sensitivity in a small handheld format. Its authentic battery-powered automated operation, simple and convenient protocol, and high efficiency make it ideal for both indoor and outdoor applications. Palm PCR is powered by a rechargeable Li polymer battery that enables more than 4 hours of continuous operation on a single charge. It can be also operated with AC power using an AC/DC adapter. It is designed to conform to the standard 9 mm-spacing well format to use with a disposable plastic sample tube, specially developed for the Palm PCR system. Nearly all kinds of DNA samples, including human genomic DNA of ≤ 0.1 ng, can be amplified within 30 minutes for up to 1 kbp amplicon. Small amplicons of up to 400 bp can be amplified in as little as 18 minutes with extreme sensitivity down below 10 copies. The dynamic range can be extended to up to 2 kbp using slow protocols.